When we started going out together my wife Nicky was really into the outdoors. Suddenly she was going out with this guy that uses a wheelchair and we had to think, "How do we adapt our world so that I can do those things with her?" I don’t see my disability as being an impairment, I see it as something to work around and fortunately, that's the way Nicky sees it too. We always try to have a can-do attitude about things. My Mum and Dad taught me that when I was a kid. 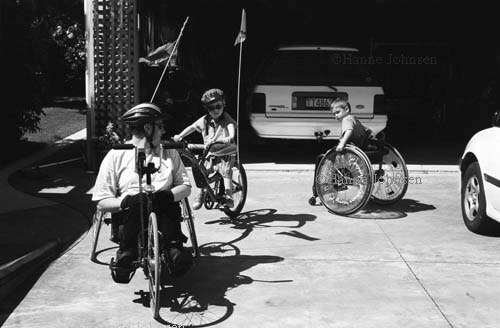 We never think, "We can't do that because Grant has a disability." Our attitude is always – "What do we want to do? OK. How can we make that happen?" So back then when we were first going out we went sea kayaking, we went skiing and we did lots of other outdoor activities together. Having our twin boys Tim and Jack has meant a whole range of different ways of adapting our life. We've had to look at the types of car seats we have for example: I can’t use booster seats because I can't stretch over far enough to be able to click them. And we've had to adapt our kitchen so that if Nicky goes away I can still be Dad and cook a meal for the boys. One of the things that we really want for our boys is for us all to be in the outdoors a lot and we've had to adapt our lives so that we can still do many of the same things that other families do. We have a tent so that we can go camping, and just recently we've got a half wheeler for the boys. A half wheeler is a bike with a wheel on the back. It's got handlebars and a seat and you attach it to a standard bike so the kids can ride behind you. And because we have two boys, we bought another one and got an adaption put on my hand cycle so that I can take one of the kids on the back of that as well. So Nicky and I can both go out with them as a family. Boys like to play rough and tumble with their Dad, but that can be a bit tricky for me if I'm in my wheelchair. So we often play games where I get out of my chair. A favourite one is a game the boys call "Islands" and it started when we were at home and I was sitting in a beanbag in the middle of the floor. The boys jump off the couches and I'm the monster in the middle of the floor, on an island. I'm asleep and they're trying to wake me up. They jump down and crawl over to me, and I have to grab them! Our whole life is really about adapting the world around us to fit what we want to do. At times that gets really tiring. It’s very easy to get frustrated, and you know, there's actually no reason why it should have to be that way. In fact, it makes sense to design things so that everyone can use them.